A concert dedicated to the memory of tenor Jack Feeney will take place in the Gateway Hotel, Swinford on Friday 16th March at 8pm. Performing on the night will be singer Seosamh O’Flaithearta, accompanied on piano by Tom Cullivan. 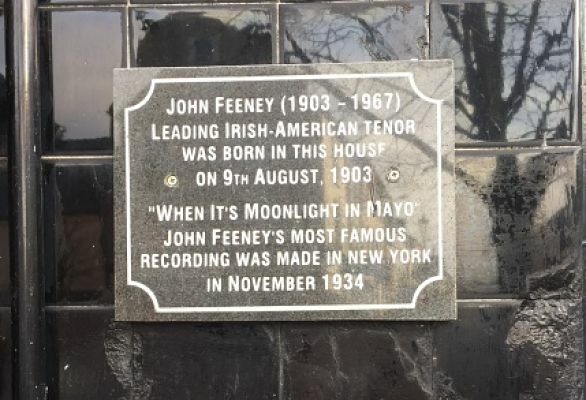 Jack Feeney was born John Feeney in Swinford in August 1903, and would go on to become an internationally renowned tenor, perhaps best known for recording the timeless “Moonlight in Mayo’ and ‘Galway Bay’, among many others. Raised in a grocery store and pub on the main street in Swinford, Jack emigrated first to the UK where he worked in construction, and then to the US after his marriage. After working hard with the Irish Echo newspaper, and performing at occasions like weddings and social occasions, in time his career grew until he became the leading Irish-American tenor of his time, performing regularly at venues like the Boston Symphony, Carnegie Hall an the Philadelphia Academy of Music. On his frequent visits home to Ireland, Jack also filled venues like the Olympia Theatre, the Cork Opera House and Limerick Savoy Theatre. After a distinguished music and radio career in the US, Jack retired to Mayo with his wife Maura, where they took over Maura’s family mineral water business, Hugh Ruddy and company. He died in 1967, and is buried in the Ruddy family grave in Ballina. While his music is not so well known as that of his contemporaries, most notably John McCormack (perhaps due to Jack’s long period in the US), his memory is treasured in his home town and regularly celebrated. A memorial plaque at the site of the family business in Swinford marks his unique contribution to Mayo musical culture and ‘Moonlight in Mayo’ holds a special place in the hearts of Mayo people the world over. This special memorial concert in the Gateway Hotel will be a great opportunity to remember and honour Jack Feeney, and also to relive memories of these special times through his unique music. The Jack Feeney Memorial Concert takes place on Friday 16th Mach at 8pm in the Gateway Hotel, Main St., Swinford. Tickets €15 available on the door on the night, or in advance from O’Connell’s Pharmacy, Mellett’s Newsagent and The Gateway Hotel.